Good Monday morning readers! This morning I bring you Sacred Herbals: Natural Aroma Therapy Bath, Body and Spa products. Sacred Herbals sent their Shakti Perfume Oil and Autumn Spice Lip Balm to try out. I had never tried natural or organic perfumes. I’m actually pretty stuck in my ways with my Calvin Klein Euphoria. So, this gave me the opportunity to try something new. 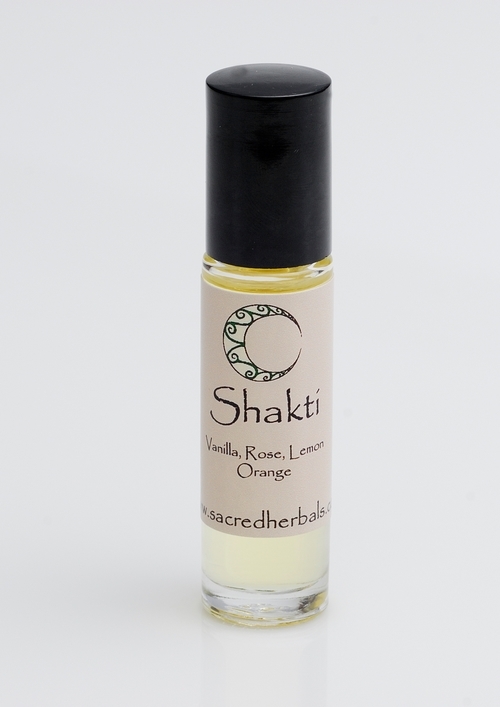 I chose the Shakti because the scents sounded appealing to me: Vanilla, Rose, Lemon & Orange. I’ve worn it several times and it does have a nice scent almost like a lemon or orange cake icing (guess that’s the vanilla). I didn’t pick up on the rose though. However, the scent is a little too light for me. Rather, it doesn’t linger. It seems as if just a few minutes after applying it, the scent is gone. I prefer to apply my perfume once and be done for the day. Same goes for my make up, I’m just not the type to run to the ladies room throughout the day and reapply. This would be a better fit for someone that is more accustom to doing touch ups during the course of the day. The lip balm was much more spicy with nutmeg, vanilla, cloves and orange essential oils and a long list of natural oils, waxes and butters to soften up dry lips. Mainstream lip balm is loaded with a ton of toxic crap you really don’t want on your lips so I definitely recommend finding a more natural alternative to keep your lips moist! Using both of these products and the opportunity to learn about Tara and her great company has been an enjoyable experience. Sacred Herbals has many other products that look simply dreamy and I look forward to spoiling myself with them! Want a chance to try them yourself? You know the routine, let’s do it! Follow @sacredherbals or @ecoofficegals and comment that you did. The deadline for entering is Wednesday 11/25/09 at 8pm EST at which time one winner will be randomly chosen. Please don’t forget to leave a separate entry and any entries that show obvious laziness i.e. a simple “Thanks for the great giveaway” will not be published therefore not counted. It’s just not fair for the people that do know how to follow simple directions. US and Canadian residents only. Thanks! Would love to try the Glow Face Serum, it sounds pretty awesome! The Bliss Bath Oil looks very nice! I’d like to try the Shakti perfume oil. I would love to try the Bliss Bath Oil. Thanks! Would love to try their bath oil, particularly the scent “Zen”. I would like to try Bolivian Pink Salts-sounds wonderful for the skin and the scent would be lovely. I’d like to try Bliss Bath Oil! I would love to try the Glow Face Serum! The coconut vanilla brown sugar scrub – that sounds like the perfect combination! I’d love to try the Bolivian Pink Salts. .-= Miranda Allen´s last blog ..***GiveAway*** HField Wi-Fire Wifi Booster =-. I’d love to try the Cleopatra Perfume Oil. Sounds delicious!! I would love to try the Inanna Perfume Spray. I love anything that smells like bergamot. I would love to try the Coconut Body Mousse. I would love to try the vanilla and Ylang Ylang coconut mousse. I’d love to try the Milk and Honey Bath, sounds very soothing! I like using body butter on my hands and feet and the Whipped Shea Body Butter is something I would like to try. i would like to try the Cocoa Butter Walnut Scrub. Hawaiian Red Sea Salts is a product I would like to try. I’d like to try the Gaia Perfume Oil. I like their Milk and Honey Bath. I want to try the vanilla and Ylang Ylang coconut mousse.